Trashed Mobiles: Ticking Toxic Time-bomb- A single mobile hand-piece can contaminate about 600,00 litres of water. The mobile phone glut in the UAE has been estimated at double that of the country's total population, with over 10 million cell phone handsets being used by the residents. An average of 2 mobile phone sets are used by each resident of the total 5 million population of the UAE, reveals an environmental expert. Posing a huge threat to the environment, about 1.3 million handsets are annually disposed by the country's mobile phone consumers, as the average life of a mobile handset in the UAE is estimated at eight months, while it is one to two years globally, said Stuart Fleming, CEO of Enviroserve, Dubai-based e-waste management and environmental solutions provider. He was speaking to The Gulf Today on the sidelines of a press conference to announce the launch of Zonzoo, a mobile phone recycling establishment that collects used phones from consumers and businesses in return for paying them directly. Fleming said, "Roughly three billion mobiles are in use worldwide, and some one billion new phones are made and sold every year. 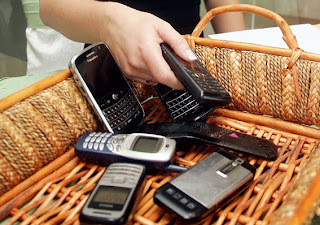 Accordingly, many of the metals used to produce mobile phones are becoming scarce." "There are three million phones just lying around and the danger is that many will eventually end up in landfill sites, where the devices gradually erode and leak out all sorts of nasty chemicals and toxins. A single mobile hand-piece can contaminate about 600,00 litres of water," he added. According to him, the basic elements like lithium, cadmium and beryllium used to manufacture mobile phones can cause serious health risks like cancer. Components such as arsenic, antimony, copper, lead, mercury, nickel and zinc are also included in a mobile set. "The global e-waste generation is growing by about 40 million tonnes a year, while the total electronic waste generated from mobile phone production is 23 million tonnes per year," pointed out Fleming. He said, "Manufacturing of mobile phones and personal computers consume three per cent of the gold and silver mined worldwide each year, and 13 per cent of the palladium and 15 per cent of cobalt." "Asian countries have the highest mobile phone penetration of developing countries, helped by their proximity to Japan, South Korea and the fact that many mobile factories are located there," Fleming quoted a recent study by Vodaphone. "Access to mobile communications in emerging markets can bring significant socio-economic benefits. But the rapid growth of the mobile market means that for the first time these countries will have a significant quantity of old handsets to dispose of," he noted. The Zonzoo mobile phone recycling company, headed in the Middle East by Stuart Fleming, offers 'cash for phones' to the consumers. It sells working mobiles phones, which could otherwise be sitting idle, collecting dust in a draw, to developing countries contributing to social cause over there. "While, those phones are no longer working go through a refining process, and the gold, silver, plastic or other materials are extracted out of the phones and then sold on to be used in other new products, offering environmental benefits," said Fleming.